A student boarding house that was part of Upper Canada College, when it was locate on the north side of King Street, is the only building that has survived from the 19th-century campus. Today, its address is 22 Duncan Street, and it is on the southwest corner of Duncan and Adelaide Streets. It was part of a large complex of structures built for the college. 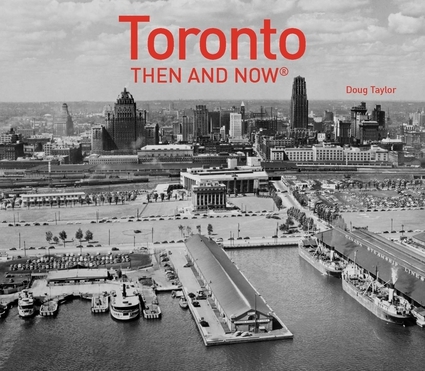 It was erected in 1833, the year prior to York being incorporated as a city and changing its name to Toronto. The above photo depicts the building c. 1890 and is from the collection of the Toronto Public Library, r-2330. The above photo is of the boys’ boarding house at Duncan and Adelaide Streets in 2013. Though the building is in good shape, it has been altered greatly over the years and today there are no chimneys. It was part of the campus of Upper Canada College, founded in 1829 by Sir John Colborne, and located on a large tract of land known as Russell Square. The square was bounded on the north by Adelaide Street, on the south by King Street West, on the east by Simcoe, and the west by John Street. The school remained on this site between the years 1831 and 1891. It was eventually relocated to a site at 200 Lonsdale Road, at the top of Avenue Road, which at that time was in the Toronto suburb of Deer Park. The old student residence from 1833 was designed in the Georgian style, with a symmetrical east facade and plain lines. The only ornamentation was the brick patterns on the corners of the building. The cornice of today is completely unadorned, though it has likely been changed several times since the building was originally constructed. The student residence was altered in 1856 by the prestigious architectural firm of Cumberland and Stone, and was altered several more times in the years ahead while it was owned by U.C.C. After the college relocated to Lonsdale Road, the other college buildings on Russell Square were demolished. The student residence is the sole survivor. It became a factory until being renovated in 1953 to be used for commercial purposes. For the past few years, the building has been vacant. An historical plaque was placed on the structure in 1986, and was the main source of information for this post. The symmetrical east facade of the boys’ residence at 22 Duncan Street. The ornamental brickwork on the corners of the building and the simple cornice are visible. View of the cornice and the brickwork patterns on the northeast corner of the building. Entrance on the east facade at 22 Duncan Street (left), and one of the large rectangular windows on the east facade (right) , with the large stone sill beneath it. When the building was a student residence, there was a large porch structure over the entranceway. It is visible on the 1890 map. First floor on the east side of the old student residence on the southwest corner of Duncan and Adelaide Streets. Map from the Goad’s Atlas of 1890 in the City of Toronto Archives. It depicts Russell Square, where the buildings of Upper Canada College were located. The boys’ boarding house is in the upper left-hand corner of the map. On the map, Simcoe is on the right-hand side and John Street is on the left. On the south side is King Street West. In 1890, Duncan Street had not yet been extended south from Adelaide Street. The dotted-line extending north-south from the top of the map, to the left of the centre of the square, is where Duncan Street would eventually be extended. The place of the map where the word “house” appears is the building that is today 22 Duncan Street. Notice that there is an extended porch on the east side of the building, in the top right-hand corner of the map. The porch has been removed, perhaps when Duncan Street was extended south from Adelaide Street. The site of the boarding house at 22 Duncan Street.